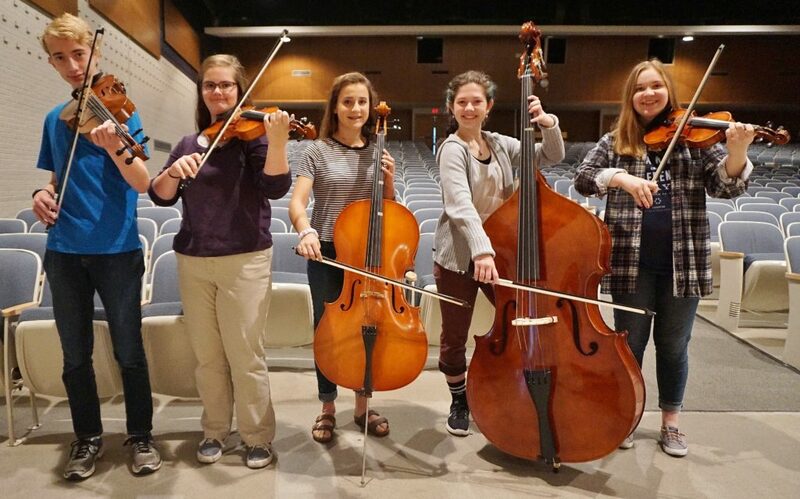 Five Penn Manor High School students, three of them freshmen, have qualified to participate in the Lancaster-Lebanon County Orchestra Festival in February. The students auditioned last weekend before a panel of judges along with other students from public and private schools throughout Lancaster and Lebanon Counties. Named to County Orchestra were Hannah Shenk, senior, violin; Eleanor Helm, freshman, violin; Jesse Kanagy, freshman, viola; Ally Rittenhouse, sophomore, cello; and Evelyn Weaver, freshman, string bass. According to Penn Manor music teacher Sara Masten, Evelyn is a cellist who just started learning the bass last spring “for fun,” which makes her accomplishment all the more impressive. Congratulations to these talented students, who will perform at the Lancaster-Lebanon Music Educators County Orchestra Festival concert, scheduled for 4 p.m. Feb. 17 at Solanco High School. From left, Jesse Kanagy, Eleanor Helm, Ally Rittenhouse, Evelyn Weaver and Hannah Shenk.